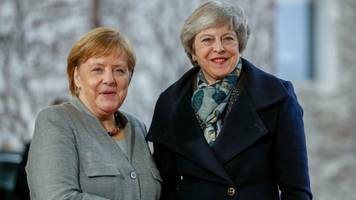 British Prime Minister Theresa May on Tuesday met Angela Merkel, the European Union's most powerful leader, to seek support for a new Brexit delay while her ministers tried to break the deadlock in..
British Prime Minister Theresa May outlined to German Chancellor Angela Merkel the steps she was taking to bring "the Brexit process to a successful conclusion" and on discussions with the opposition..
British Prime Minister Theresa May on Tuesday met Angela Merkel, Europe's most powerful leader, to seek support for a new Brexit delay while her ministers tried to break the deadlock in London at..
A German government spokesman dismissed as "without any foundation" reports that Chancellor Angela Merkel was prepared to limit to five years the so-called backstop that would prevent a hard border in..
Theresa May seeks support from Berlin and Paris to delay Brexit before an emergency EU summit. The Prime Minister will meet with the EU’s two big players – Germany’s Angela Merkel and France’s Emmanuel Macron – before European leaders gather to decide on the extension. 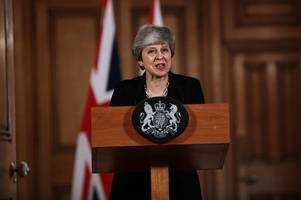 British Prime Minister Theresa May will meet Chancellor Angela Merkel in Berlin on Tuesday to discuss Brexit, a spokesman for the German government said on Monday. 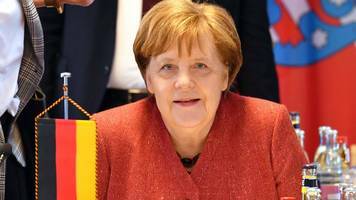 German Chancellor Angela Merkel said on Thursday she hoped discussions between Prime Minister Theresa May's government and the opposition Labour Party could break the Brexit impasse by an April 10..
German Chancellor Angela Merkel said on Thursday she hopes cross-party crisis talks in London to try to break the domestic deadlock over Britain's exit from the European Union can produce a common..
German Chancellor Angela Merkel was speaking after talks with Irish PM Leo Varadkar in Dublin. 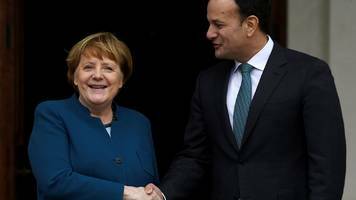 German Chancellor Angela Merkel will meet Irish PM Leo Varadkar to discuss the Brexit deadlock. German Chancellor Angela Merkel will meet residents who live along the border between Ireland and Northern Ireland during a visit to Dublin on Thursday to discuss Brexit to learn what impact any return..